This piece published by The Economist.com about one of Yemen's well-established photographers, Boushra Almutawakel. I had the previlige to meet Almutawakel several times when I was in Yemen. I did this previous interview with her and I can't tell you how modest and talented she was. In the following piece written by the Economist.com, Almutawakel shares her thoughts about her photography work and her views on some of the political and women's issues in Yemen. BOUSHRA ALMUTAWAKEL, a Yemeni photographer, aims to provoke discussions about social norms and question the ways people and cultures judge one another. Her stylised portraits, mostly of Middle Eastern women, challenge the view held by many in the West that the veil is a symbol of oppression. Issues of identity are central to her work. Though she is skeptical of veils that completely obscure the individual, she draws similarities with the way some women hide behind heavy make-up: in both cases, a woman is concealed behind a social mask of sorts, often for her own comfort. Ms Almutawakel is openly critical of certain social expectations of women in Yemen, yet she wears a long black abaya in public because she "wouldn't feel comfortable otherwise". This ambivalence pervades her work. 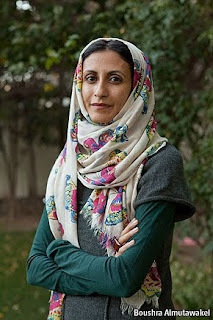 Having studied in America, Ms Almutawakel has returned to live and work in Sanaa in Yemen. Her photographs—controversial among Yemenis—seem designed mainly for a Western audience. But some can now be seen in a show of regional artwork at the National Museum of Yemen in Sanaa. 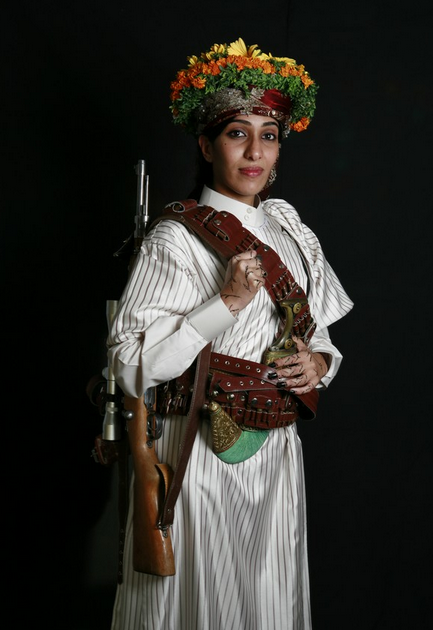 Ms Almutawakel recently met with The Economist to discuss her photography, her views on women and the role artists play in revolutionary Yemen. I realised, to my great surprise, that men's traditional clothing is very similar to women's clothing—long, loose, modest and often with a head-covering. The focus in Western media is always on the way women are dressed so I wanted to challenge this idea. The work also shows that women are strong and, when given the opportunity, they can do what men can do. I also like the idea of feminising things. I am sure the world wouldn't be in the mess it is in if there were more of women's qualities, such as nurturing, in the world. Much of your work focuses on women's veiling. Why is that? It’s more controversial in the West, where the hijab and veil have become symbols. Veiling is part of the culture here, mixed in with religion. 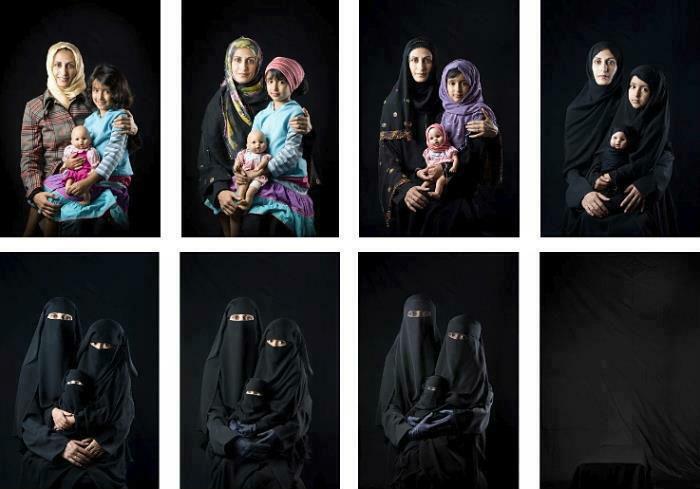 I think it's what women are used to wearing—and I don't feel comfortable without it in many places in Yemen. This is a highly segregated society in which men don't have much interaction with women, though that is changing in the cities. It is advantageous and empowering in some ways as it protects and privatises the woman's body. You seem to be criticising and defending veiling at the same time. A lot of people think that covered women are oppressed, backwards and uneducated. That is far from the truth. 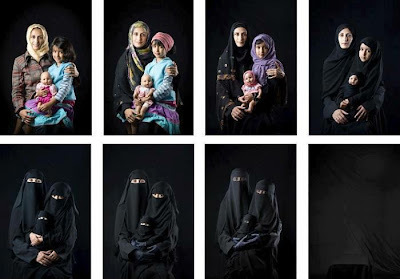 But at the same time I can't hear very well if I am veiled and I can't see the lips of women wearing the niqab. The biggest problem I have is with children being covered—there is nothing Islamic about that. I prefer our traditional veils which are colourful and more open. The black we've imported from the Gulf and the Wahhabis—with gloves and the rest of it—is too much. But women do have the choice. Well, you have to have an open family to not cover because they, the culture and religion are such imposing forces. I had family members who wanted to wear the hijab [rather than the niqab] and it became a huge issue. It's perhaps the equivalent of you walking naked in the West! But I also disagree with France saying a woman can't wear a burqa or a hijab in school; that seems a violation of human rights. No. I have done a lot of work for international organisations. I have travelled all around the country to beautiful, remote areas where you wonder how people ever got there. Now it is harder to travel with the security situation. 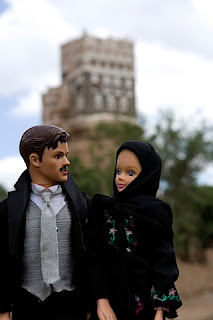 Of all my work, my favourite series might be Fulla, the Islamic Barbie doll. I thought it was wonderful to have something representative of our culture. Rather than having blue-eyed, blonde Barbie, this is a celebration of diversity. I thought it was interesting to tell women's stories through the doll because it is more acceptable. So I took a series of photographs showing her going to university, spying a young man she liked and going on trips. It's a fun series. Yeah, but it is stuff that happens. Girls in university have all had crushes. There is so much that goes on that doesn't get discussed. Yemeni men didn't take too well to my "What if" series, in which the man becomes covered and the woman uncovered over the course of the series. A few women questioned it too, but I was shocked at how many went out of their way to tell me they liked it. They said the men should see what it’s like to be covered up! The wonderful emerging talent was made clear during the revolution. It inspired a lot of the younger generation to design things, take photographs and post work online. I have to say, it didn't inspire me at all. I was worried for my children and our safety and I can't work without peace of mind. I went with some journalists and photographers to photograph the protesters, but it really wasn't my thing. Everyone was asking us to take pictures of the dead and I found that offensive. Hopefully this year will be a better work year for me.